Note: This ARC was provided by the authors via L. Woods PR in exchange for an honest review. 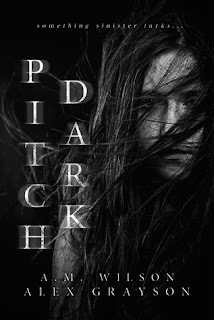 Pitch Dark is a standalone psychological thriller slash dark romance and was co-written by authors A.M. Wilson and Alex Grayson. Between the two authors, I've only read one novel from Grayson while Wilson is new to me. These two melded their writing talents together rather well, weaving a story that isn't easy to read, what with events in the story that are potential triggers for some readers. It is, indeed, dark, but there is a glimmer of light--of hope--in this book, one that comes about as we get to know the main characters--Niko James and Jane Doe--as well as Niko's history with Aislin Mathers, the girl who became his best friend and later the young woman he fell in love with before she disappeared and never heard from again. Niko may not have been able to save Aislin from the person who took and killed her. No one listened when he insisted she had been taken and didn't simply run away. But with the discovery of Jane Doe, maybe Fate has thrown this police detective a bone--a one of a kind opportunity to right wrongs and help Doe get the justice that eluded his Aislin, and this time, no one can stop him. Learn more about A.M. Wilson and Alex Grayson. Purchase Pitch Dark on Amazon.